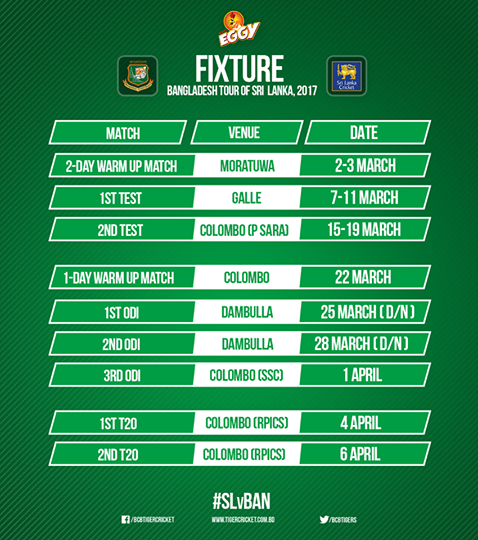 Bangladesh Cricket Board and Sri Lanka Cricket have confirmed the schedule of Bangladesh tour to Sri Lanka which will start from February 27th and will last till April 6th. Bangladesh will play 2 tests, 3 ODIs and 2 T20Is there. Bangladesh will play their 100th Test match in this series. The tour will start with a 2-day warm up match on 2nd March, followed by 2 Tests. Another 1-day warm up match will precede the 3-match ODI series. The 2-match T20 series is scheduled to take field at the end of the tour.